Philatelists Rejoice over Recovered Envelope Robert Siegel talks with Charles Snee, senior editor at Linn's Stamp News, about the recently rediscovered "Ice House" envelope, believed to be lost for 38 years and recently rediscovered in Chicago. It has the only known cover of an 1869 Abraham Lincoln 90-cent stamp. Robert Siegel talks with Charles Snee, senior editor at Linn's Stamp News, about the recently rediscovered "Ice House" envelope, believed to be lost for 38 years and recently rediscovered in Chicago. 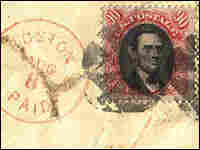 It has the only known cover of an 1869 Abraham Lincoln 90-cent stamp. The rare 90-cent 1869 Abraham Lincoln stamp on the "Ice House" envelope (in the enlargement). The envelope gets its name because it's addressed to: "Ice House Calcutta E. Indies." We are reliably informed that among philatelists, stamp enthusiasts and collectors, the national buzz is all about the Ice House envelope. If we knew anything about postage from 1869, we would all, evidently, know about this. It has a very rare $.90 stamp on it, and it's been missing since burglars made off with an Indianapolis stamp collection in 1967. The story of how it turned up in a Chicago stamp shop, the story of estate sales, insurance policies, conflicting claims of ownership, it is so complicated, we shall not even attempt to relate it here. But as to the envelope and the stamp that's on it, for that we turn to Charles Snee, senior editor at Linn's Stamp News, in Sidney, Ohio. Welcome to the program, Mr. Snee. Mr. CHARLES SNEE (Senior Editor, Linn's Stamp News): Thank you very much, Robert. SIEGEL: First of all, why is this called the Ice House envelope? Mr. SNEE: Well, because of its address. It was sent to a gentleman named James Bancroft, addressed to Ice House, Calcutta, East Indies in the early 1870's. SIEGEL: So the envelope actually has the address on it, and then it has a stamp on it. What's the stamp? Mr. SNEE: Well, when the envelope was first mailed, it actually had three stamps on it. It had the $.90 Lincoln, of course, a $.10 stamp, picturing Thomas Jefferson, and a $.12 cent picturing, let's see, Henry Clay. SIEGEL: And of these, I assume it's the $.90 Lincoln that's the most unusual? Mr. SNEE: Yes. The $.90 Lincoln is very important because this particular cover is the only genuine envelope that bears a $.90 Lincoln from the series of 1869. So therefore, it is something that a collector of this particular group of stamps would need to have in order to have a complete collection of envelopes bearing these stamps. SIEGEL: Now, apart from its rarity, tell us something about this 1869 $.90 stamp that implies value. Mr. SNEE: Well, of course, it had a very limited printing. I don't know the exact number. But it was used primarily on overweight parcels and heavy packages. Most of these on the receiving end, if a collector happened to get a hold of the envelope or the package wrapper, the stamp would have been soaked off and subsequently sold to be placed into a collection. Very, very, very few of them were actually kept on the piece used to send the contents. And that's why this particular cover is so scarce and desirable today. Mr. SNEE: In many cases, that is correct. SIEGEL: Well, how valuable is this? Mr. SNEE: Hard to say. The numbers that we've been hearing floating around could be anywhere from the high six figures to perhaps upwards of a million dollars. SIEGEL: What does the $.90 stamp look like, by the way? Mr. SNEE: Well, it has a rather ornate border or frame, with U.S. Postage across the top, $.90 around the bottom, and two numeral 90's in the corner; and it has a nice elegant engraved portrait of our 16th president in the center. It's an attractive looking stamp. SIEGEL: Is it common for a rare and valuable stamp to go missing for a few decades? Mr. SNEE: I would say it's not as uncommon as you might think. The difficulty with such items is that at least within the hobby community, they're so well known that if a thief takes it and then tries to resell it on the market, he's going to have a very difficult time convincing someone that, well, I just happened to come by this thing. Immediately, someone is going to think, well, it was taken from somebody. Mr. SNEE: Absolutely. Exactly. That's an excellent example. SIEGEL: Do you want to buy it from me, and I'll, you know. Mr. SNEE: That's an excellent example. SIEGEL: Well, Mr. Snee, thank you very much for talking with us. SIEGEL: Charles Snee is senior editor at Linn's Stamp News in Sidney, Ohio. You can see the stamp and the Ice House envelope at our website, npr.org.